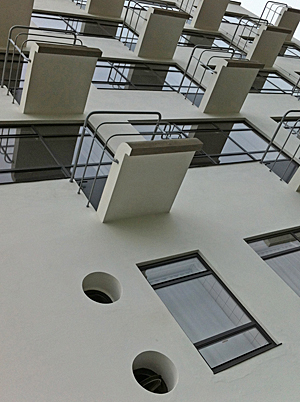 Designed by Walter Gropius and built in 1925-6, the Bauhaus building in Dessau has undergone extensive restoration. 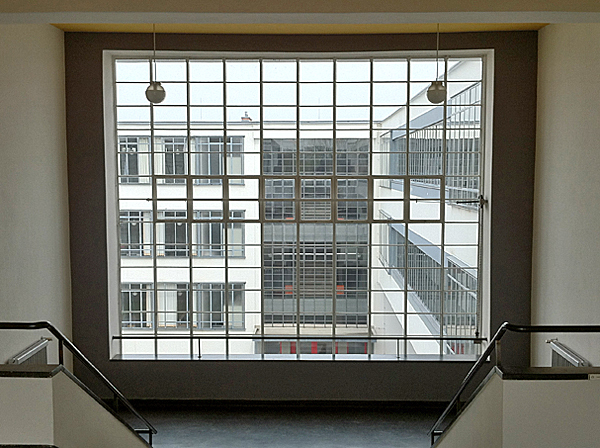 Work was completed in 2006 (www.bauhaus-dessau.de). The influence of this design school on architecture, furniture, fashion, photography and education is well documented. No designer is immune from the Bauhaus effect, whether supporting or resisting its respect for the qualities of materials and commitment to unadorned functionality. It’s no wonder that Steve Jobs acknowledged the Bauhaus legacy as source of Apple’s industrial design ethos — not just the white minimalism and the aim of simple, accessible functionality, but the sense of playfulness in both product development and in the final artefacts. 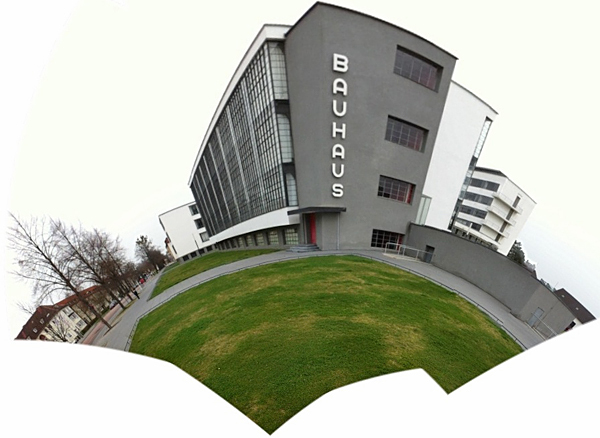 As homage to the Bauhaus legacy and the technological triumphs of the digital age, here are some images of the Dessau Bauhaus headquarters taken with my iPhone in April 2012 — deploying the 360 app and the iPhone’s HDR function. Here are some highlights from Walter Gropius’ 1926 short pamphlet “Principles of Bauhaus Production.” The full text is available as a PDF from Dr Buszek’s course website at Kansas City Art Institute. The school is the servant of the workshop, and will one day be absorbed in it. Therefore there will be no teachers or pupils in the Bauhaus but masters, journeymen, and apprentices. The manner of teaching arises from the character of the workshop: Organic forms developed from manual skills. Collaboration of all masters and students — architects, painters, sculptors — on these designs with the object of gradually achieving a harmony of all the component elements and parts that make up architecture. For some Bauhaus party snaps see: 1, 2, 3. Isaacson says of Jobs’ college years: “Vegetarianism and Zen Buddhism, mediation and spirituality, acid and rock — Jobs rolled together, in an amped-up way, the multiple impulses that were hallmarks of the enlightenment-seeking campus subculture of the era. And even though he barely indulged it at Reed, there was still an undercurrent of electronic geekiness in his soul that would someday combine surprisingly well with the rest of the mix” (p.36). … modernity is not all straight lines, sobriety and the technically rational. Itten, Johannes. 1973. The Art of Color: The Subjective Experience and Objective Rationale of Color. Trans. E. von Haagen. New York: Wiley. Whyte, Iain Boyd. 2004. The Expressionist Utopia. In M. Hvattum, and C. Hermansen (eds. ), Tracing Modernity: Manifestations of the Modern in Architecture and the City: 256-270. London: Routledge. See Bauhaus online. Also see Countercultural values on Steve Jobs, and Panoptic man on digital panoramas. 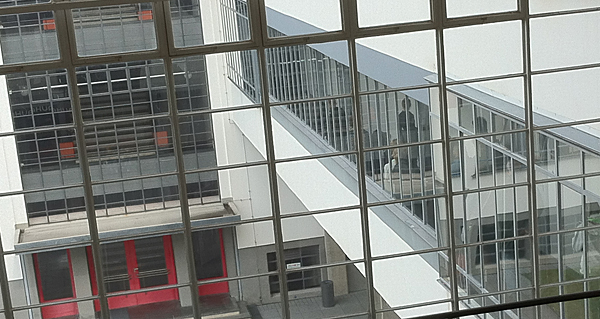 the new-old Bauhaus could really do with running water, lights, and a touch more in the way of reflective surfaces. Then again building as workshop is probably seldom also designed as sculpture to be walked around. Hi Erik, I guess that’s one of the criticisms of the whole movement. 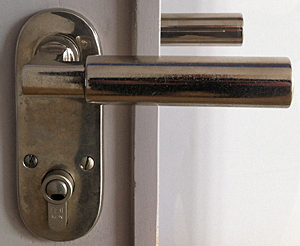 Looking functional is more important than being functional, though that’s not one of the principles. … I wonder if the same can be said of my iPhone. Hi Richard, thought provoking as alyways. Yes I agree with you. Actually I think function is one of the most difficult and elusive words in architecture. In a similar vein, I’ve been writing something on organic architecture as a psychological rather than formal design theme in Scandinavian architecture. And here in Denmark* this week there is a conference on retrofitting buildings, hopefully with digital media, so this is all quite pertinent to me. *yes I have moved from Australasia to Aarhus and the Digital Humnities Lab DK, if you do work with EU projects like DARIAH (http://www.dariah.eu/) we may well meet. Many thanks for the fascinating links Erik. Part of the cleverness of Paul Bourke’s panoramas is getting rid of the blind spot or footprint where you would expect the camera to sit. Good to see SL is still on the boil. I was at a Designing Interactive Systems conference in Aarhus in August 2010, probably before you moved there. I love this building! I am an architect and my field of study is bio architecture (I am studying a masters degree about biodigital architecture). I find myself thinking about the Bauhaus principles, they seem like a great way to run a modern day design school. Rather then a student lecturer relationship, I think the more hands on approach of apprentice, journeyman and master would keep students more focused and able to learn quicker. Instead of a first year student learning the basics and told they’re years away from being able to do such and such, in the Bauhaus system they would be working on that complicated project with the help of masters and journeyman showing them the ropes and giving them the confidence to do it themselves .